The penny in the picture is for reference only. 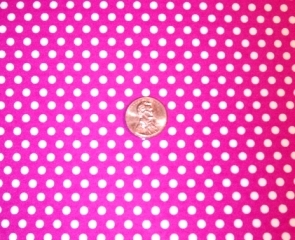 It shows you the size of the polk-a-dot pattern in relation to the size of a penny. The color in the picture is Hot Pink. vinyl sheets may be + or - .5 of an inch depending on the cut. 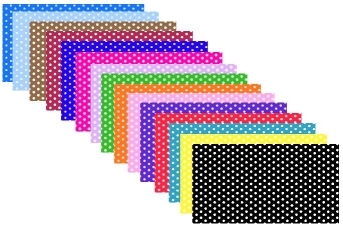 6x12 POLKA DOT VINYL Sampler Packs! 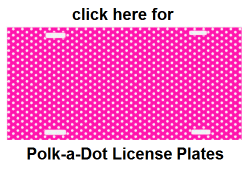 POLKA DOT SAMPLER PACK #1 : $22.95, includes: One of each color (15 sheets) of 6x12 Polk-a-Dot vinyl with white polka dots. Colors are: Black, Red, Dark Red, Orange, Yellow, Baby Blue, Blue, Dark Blue, Lime, Hot Pink, Pink, Purple, Lilac, Teal, & Chocolate. These 6x12 sheets normally cost $3.95 each, but with this sampler pack you will pay less than $1.53 per sheet! The colors listed above are what the backgound color will be. The polka dots will be white.